Samgyupsal is another popular Korean meat dish. It consists of thick pork strips, served in the same fashion as galbi but there is no marinating involved. 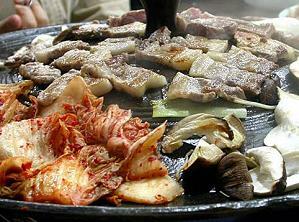 Sometimes it is cooked on a grill with kimchi, mushrooms, garlic, onions and consumed altogether. This dish is usually served with a side of lettuce, spinach, or other leafy vegetable(s), which is used to wrap a slice of cooked samgyupsal. A dab of ssamjang (usually made of kochujang or dwenjang), kimchi, or other side dishes are also added and then eaten as a whole.